Card Worthy: Happy Birthday, Taylor!! It's Taylor's birthday and I've got a blast from the past with a twist for her. Was your shiny new Silhouette a little treat for your birthday, Taylor? Well...I created a little something so Taylor can play with her new toy using her own TE images from For the Love of Cupcakes!! 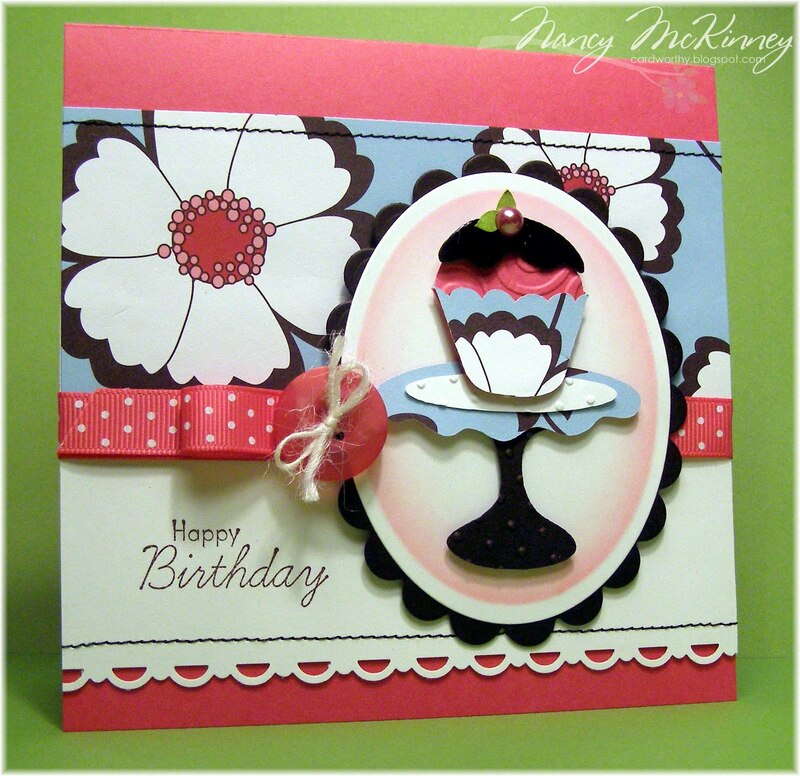 The cupcake and its liner and frosting together with the stand were all cut using my Silhouette SD, which made paper piecing a breeze. The frosting is then coated generously with layers of crystal effects and topped with leaves also cut with my Silhouette and a lovely half pearl. 'Happy Birthday' is from Extra Credit inked in Adirondack espresso. The cupcake itself is in SU melon mambo cardstock then embossed. I sponged the nestie oval frame with SU pink pirouette and melon mambo. Mmmm...I like that colour and thought it paired nicely with the American Crafts Romaine a la Carte patterned paper. Have a fabulous day, Taylor, and everyone stopping by! This is GORGEOUS Nancy!!! 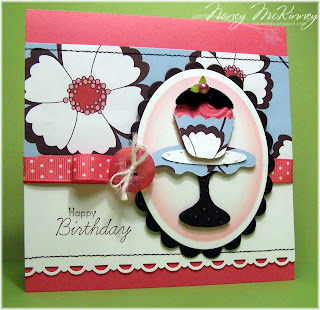 I love the embossed swirl on the cupcake along with that icing and the sweet pearl and leaves!!! Oh good grief, you smart woman -- made your own Silhouette cut files? Amazing!! And I know Taylor will love her Silhouette, too! Absolutely gorgeous card! GAH!!! I LOVE THIS! Now I am super excited to get that Silhouette!!! This is the most elegant cupcake I've ever seen! Super cute, Nancy!! Wow that is one awesome cupcake Nancy!!! I just know you are going to make me regret not getting a Silhouette aren't you? THUD!!! Love this card Nancy! Can not wait to get my Silhouette...sooooo fun! Taylor is going to just love it. Hope you have a nice weekend. What a fantastic card, Nancy! Love the colors and that yummy cupcake! Beautiful card! The colors are so pretty. 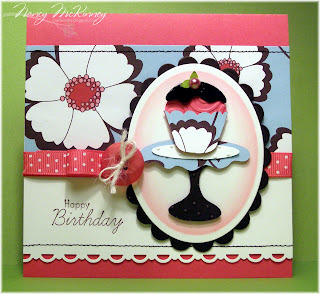 Love the floral paper and sweet cupcake. Oh how sweet, Nancy! Taylor will love that giant cupcake! Oh my goodness, this is just GORGEOUS!! And that patterned paper just makes me drool! Always love to see what you come up with!